Surprise! 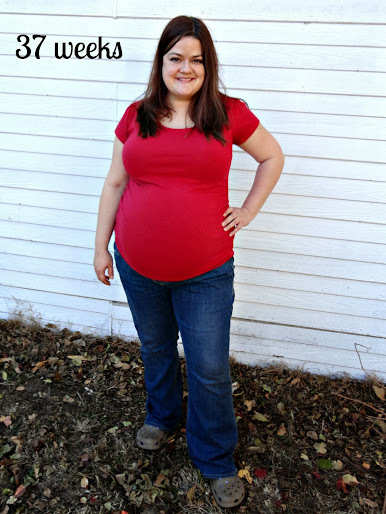 My water broke before work last Friday and although my labor started a few hours later, it was slow-progressing and I was induced later at midnight. Joshua Isaac was born happy and healthy on November 23, 2013 at 4:30 pm, weighing 6 lb. 14 oz and 18 1/2 inches long. Praise the Lord! I’m so in love with this little man that I can’t stand it. I’m just so so thankful for this precious miracle. I have so many pictures but will share a few for now. I’ve discovered that new parents sleep on average 1 hour a day (or at least, that’s my average since my water broke), and the rest of the time is taken up with caring for baby and figuring out how to do this parenting thing. It’s overwhelming and wonderful at the same time. Posted in Announcements & Awards, Joshua, Pregnancy. Bookmark the permalink. 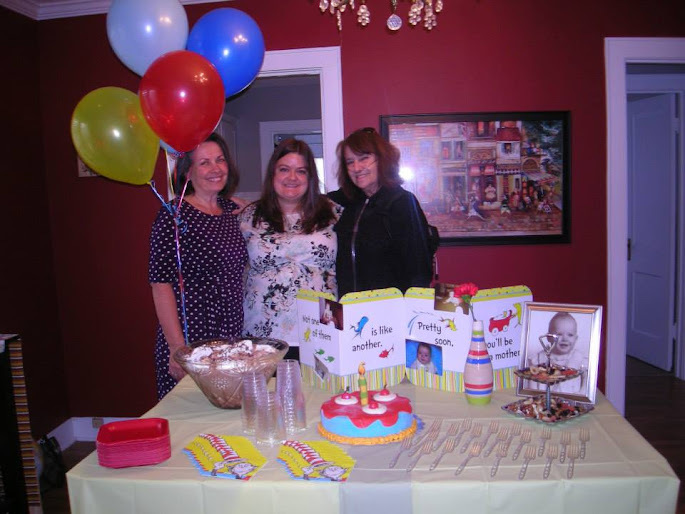 With my hostesses, Teri and Sharon. When we found out we were pregnant, we told our church family before anyone else because we needed their prayers and support the most while we were waiting for a safer time to announce to family and friends. God surely has answered those prayers, bringing us this far! 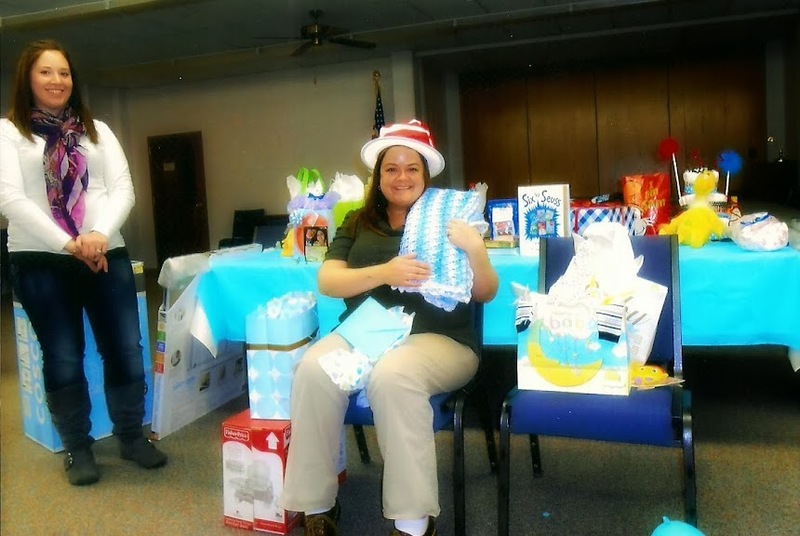 Teri, our preacher’s wife and my good friend (I kind of think of her as yet another mother on my long list of mothers-lol), was the first who asked if she could throw me a baby shower. Sharon, another sister, was second! While I knew I’d have to have one in Wichita (Teri initially wanted to do it at her house in El Dorado), I though a smaller shower with my sisters in Christ would be so nice and happily agreed. Me and Teri after a long day of pie baking! We actually ended up having the shower in Wichita after all, at Sharon’s house, so that everyone could make it, but I was actually grateful to have this separate, more intimate shower. 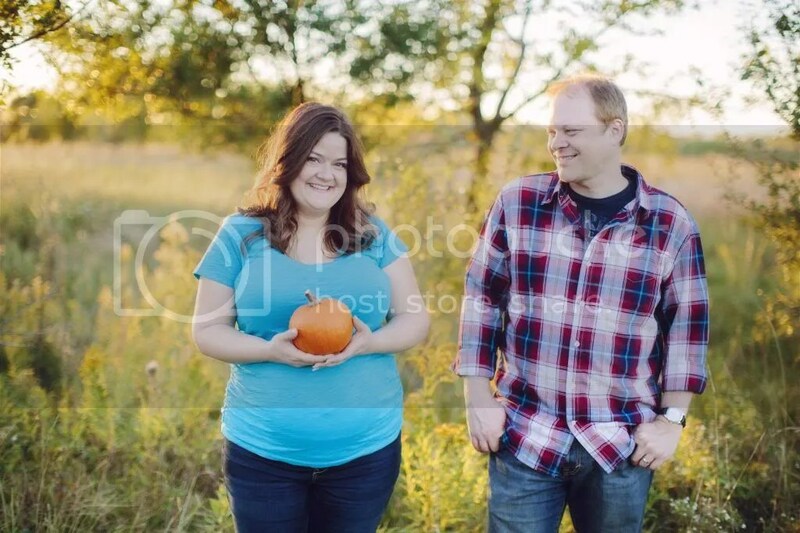 We could have easily fit everyone into my Lil’ Pumpkin Shower, but that one was fairly large as it was, and it’s just a lot harder to connect with guests when there are so many. With this smaller one, it was so fun, so relaxing, and my face literally hurt afterward because I laughed and smiled so hard the whole time. 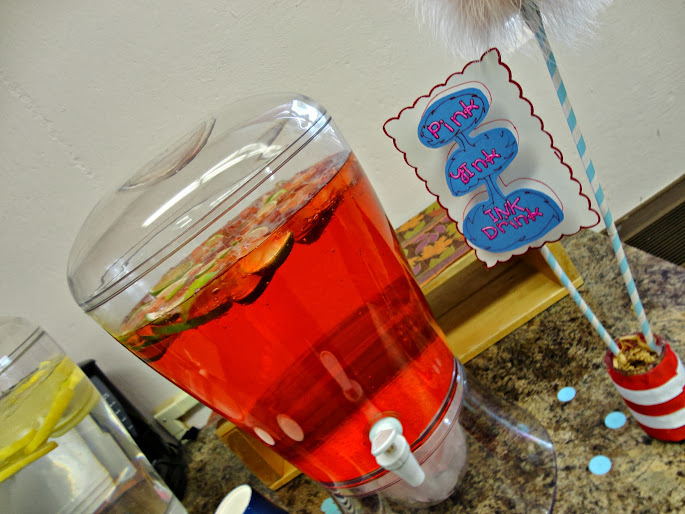 Teri made the punch and Sharon had a co-worker make the cute cake. Are you eying that decadent punch like I did? Chocolate Mocha Punch, people! That’s what I’m talkin’ bout. 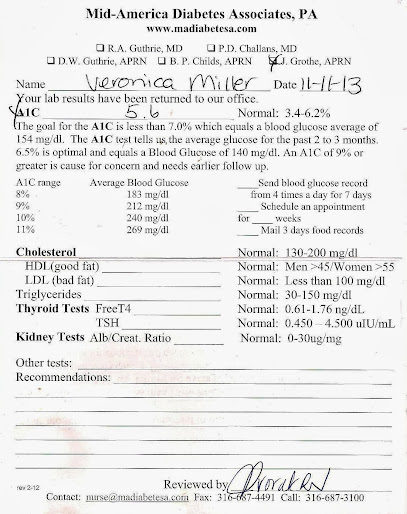 And while I do have a cup of coffee at least once a week (my doctor approved one cup a day), I didn’t have to worry about caffeine because Teri used decaf coffee. I couldn’t even tell! Soooo delish. 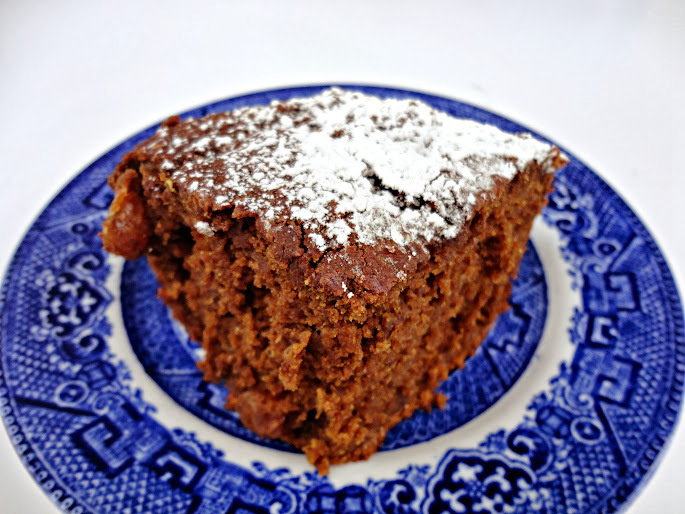 Definitely sharing this recipe next week! Sharon started us off with games, and I know the picture’s fuzzy, but the yellow thing hanging from her hands is a tape measure. She measured my waist and everyone had to write down their guesses as to how many inches my waist is. 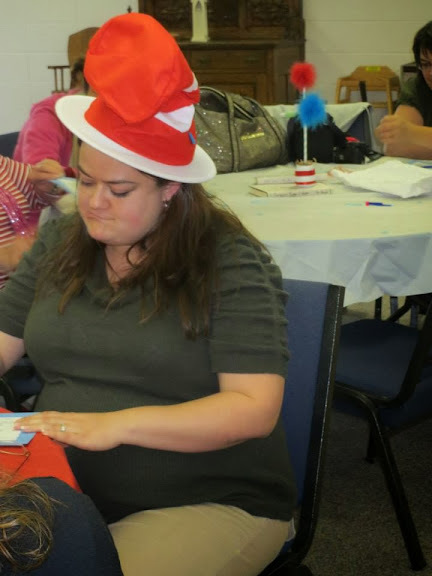 Usually people cut off pieces of yarn or lengths of toilet paper as long as they think will fit around the mother-to-be’s waist, but this way was faster and actually a lot more fun, because Sharon read the answers aloud. The answers ranged from 24″ (Awwww, my sweet girl Tara guessed that one and Teri rightly said, “We’re not talking about her ankles!” HA! ), all the way up to 150″. YIPES! We were laughing so hard! Of course you wouldn’t want to play the game this way if the mother-to-be is the sensitive type. I’m not at all, or at least not with my sisters. We have so much fun joking around. And if you’re wondering, my waist is a honkin’ 54″. Wow! This is me and my girl, Tara (the kind soul who guessed my waist was 24″…which actually got more laughs than the one who guessed 150 – ha!). 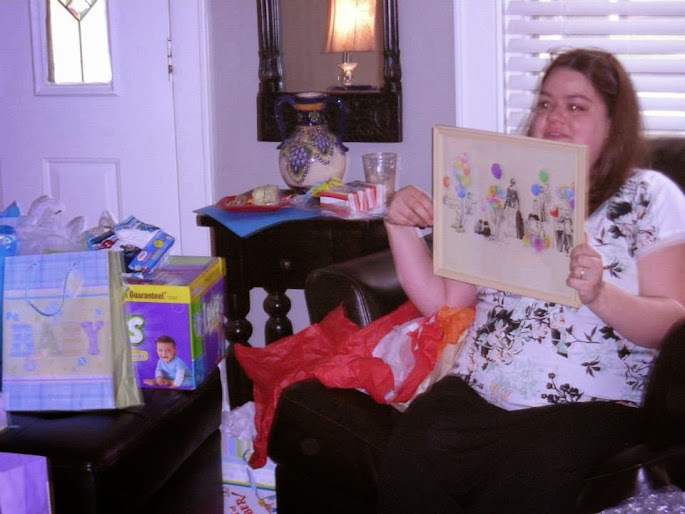 I’ve mentioned her a lot on my blog because she is a great self-taught artist and I’ve shown off some of her work, including how she pimped my stained jeans, won a ribbon for her artwork on Den’s guitar, and most recently, made me a “Cupcake in the Oven” shirt. She also took most of these pictures for me, and also the pictures in the video I made about our “Happy Ending” of us announcing at church and the subsequent hugs and tears that followed. 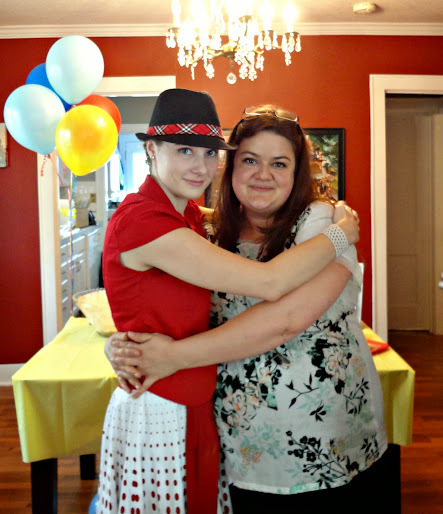 This girl would do anything I asked her to – she is just the sweetest. And it just so happened that I opened her gift first. I took my time studying the picture before I showed everyone else. Once what I was looking at sunk in, the tears started. Take your time and really look at the images from left to right in the second photo below. My son’s life…seeing him grow up and grow old with his wife in a single picture frame…was just so touching. It also made me realize that wow, we’re bringing another life into this world that can bring more life and one day, he’ll be old with someone (we hope) like we are today. :) It’s a beautiful keepsake that will always be on our walls, and some day his. 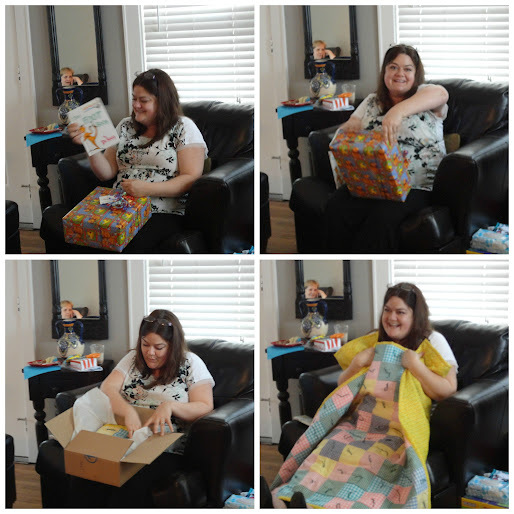 Again, gift-opening photos are so boring, so here are some collages. I got a lot of wonderful, useful gifts. Yay for more diapers and a flexible plastic bib that catches food! This quilt was from Judy (Tara’s Grandma, who managed to escape the camera), and all her Granddaughters helped by putting the ties on each square. This quilt is just like the ones my Grandma Davis used to make and the kind we grew up with, so it really takes me back. I got a rag quilt from Teri with a musical theme since Dennis plays guitar and I sing, a “dog gone handsome” sleeper with dogs on it from my Mother-in-law (she sent it with me from the last shower since she couldn’t make it, and Joan sent a gift too because they’re the best EVER), some cash from Susan and on the card she wrote “I didn’t know what you needed, but cash is always useful. Rex and I use it to this day.” LOL!) and a sweater wrap that Marissa knitted for Joshua when he gets a little older. Dennis says it looks like something Anakin Skywalker would wear so he appoves. LOL! I got a lot more gifts but I think you get the idea. It was a wonderful shower and a wonderful closing to all my showers. God has blessed us so much through the people he’s brought into our lives and I just couldn’t be more thankful. 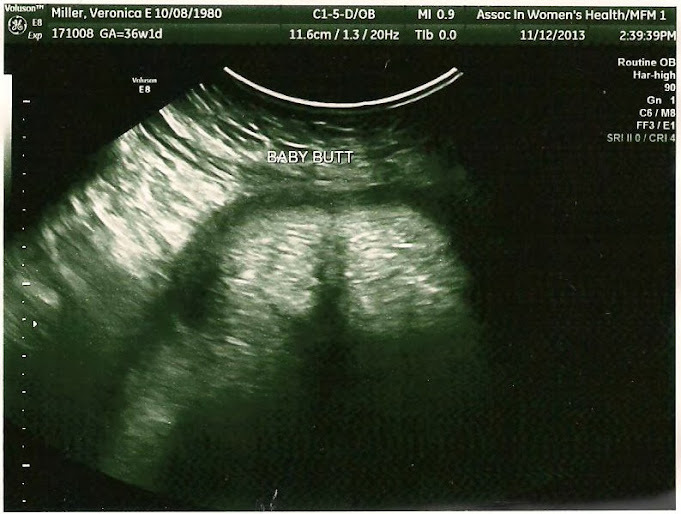 Posted in Pregnancy. Bookmark the permalink. 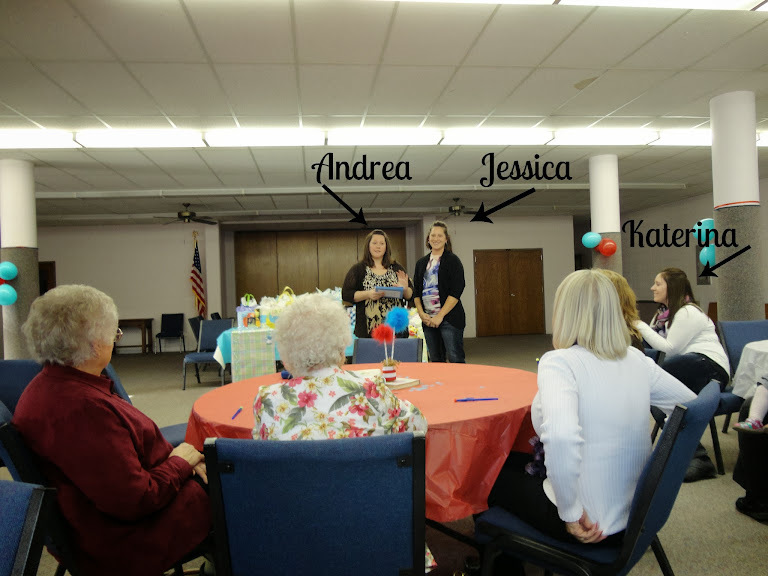 This shower was thrown by my family-in-law– cousin Andrea spearheading it with help from her three sisters, her Mom, and my sister-in-law, Joan. 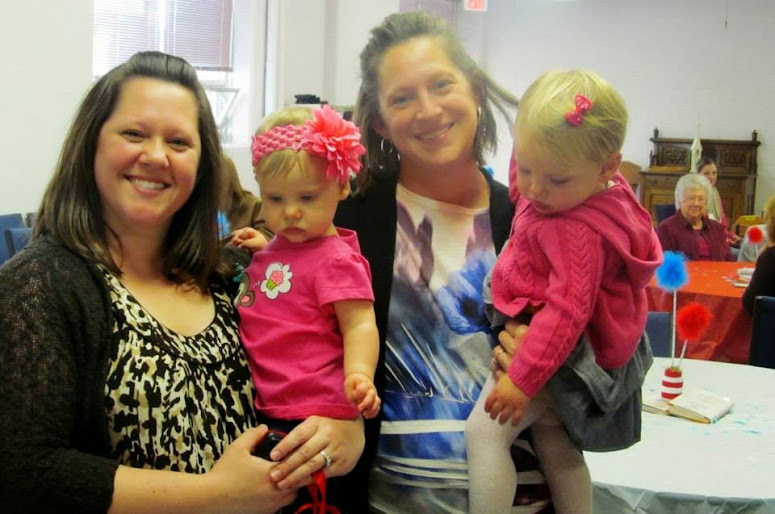 Hostesses & sisters Andrea & Jessica with their beautiful baby girls. Aunt Becky (Andrea, Jessica, Katerina, and Tessa’s Mom-you can see why they’re so beautiful!) 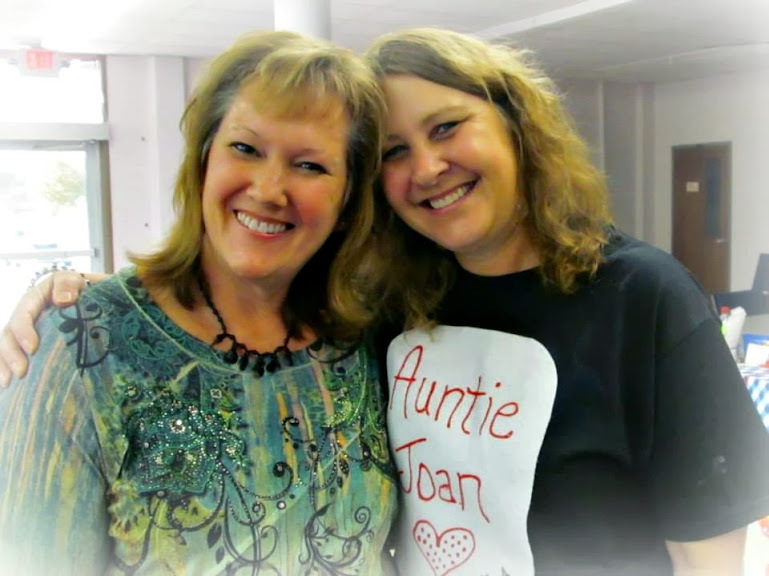 and Auntie-to-be, Joan. I was so impressed with all the creativity that went into this shower! 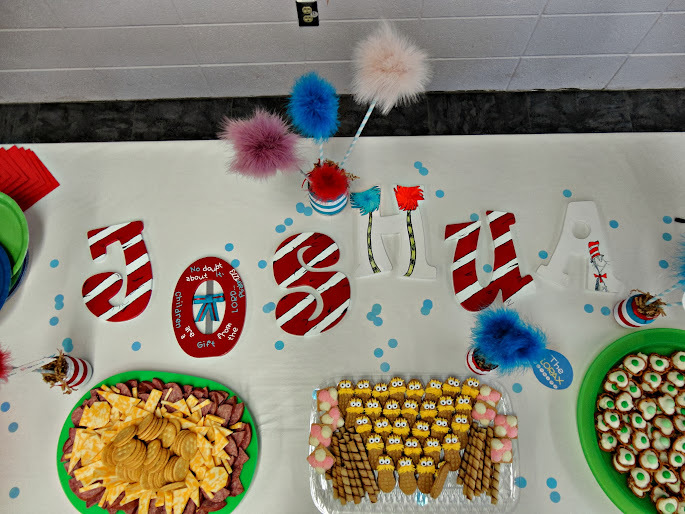 I was in love with everything on the food table and it took me a while to look past the food and notice the letters spelling out Joshua’s name, painted to match our nursery. I had these letters pinned on my Pinterest registry and hoped I could talk an artist friend into making them because they would have cost quite a bit from the Etsy artist who was selling them (not that they’re not worth it, but I’m thrifty). I never did ask anyone since Momma Donna put vinyl decals over the crib, but I’m so glad Andrea saw my pin…and made them herself! I had no idea she was an artist, let alone an amazing artist! She surprised the heck out of me. 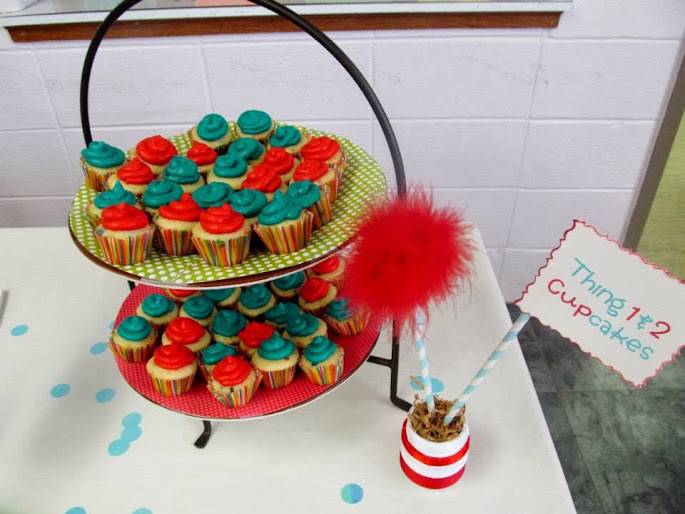 I cried, especially when I saw that she managed to incorporate a Bible verse into them. 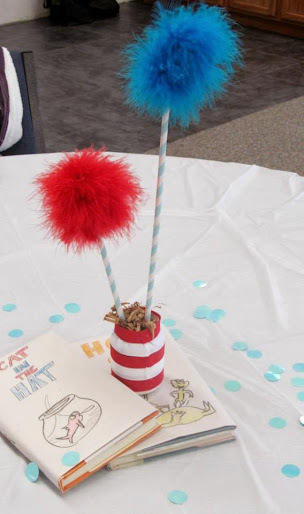 My only regret about our Seuss theme is that there are no good Seuss quotes about or connection to God or the Bible, but she nailed it with this translation of of Psalm 127:3, which could have come straight from a Seuss book, and she made it even better by putting a cross in the middle of it. If that isn’t the most wonderful, creative thing, I don’t know what is. Thank you so, so, much Andrea! You are a treasure. I know I tend to focus on food, but like I said before, this is a food blog after all, so I figure if you’re reading, that’s what you’re most interested in too. 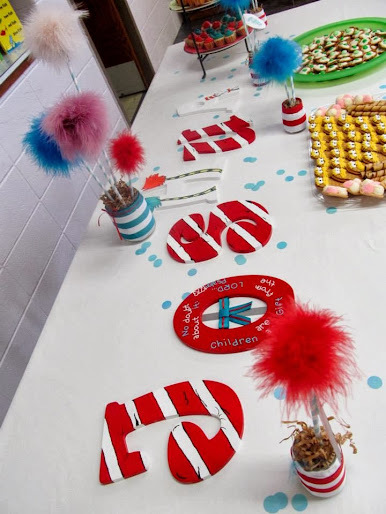 Each thing on the table had a cute Seuss-y label. 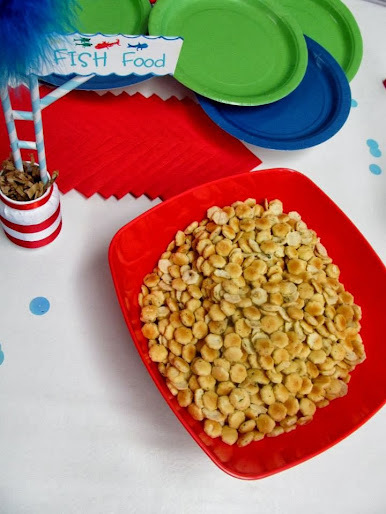 These seasoned crackers (“fish food”) were made by Auntie-to-be, Joan. Did you just die? 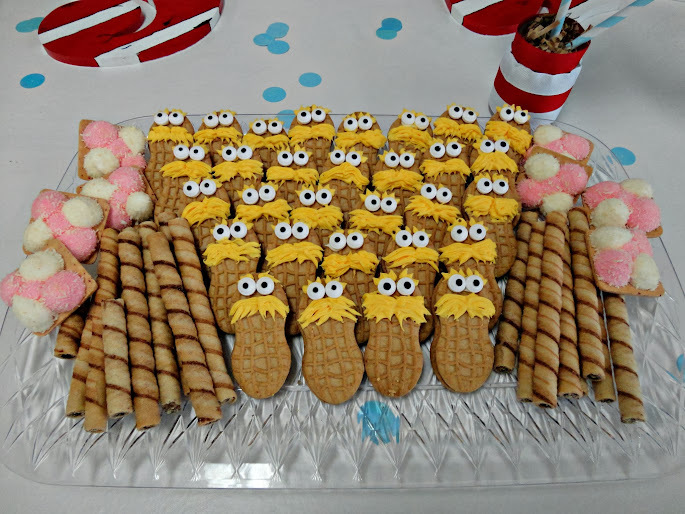 Because I almost did when I saw these Lorax Nutter Butters and truffula trees made with chocolate wafer rolls and coconut marshmallows melted onto square cookies (possibly Lorna Doone shortbread). 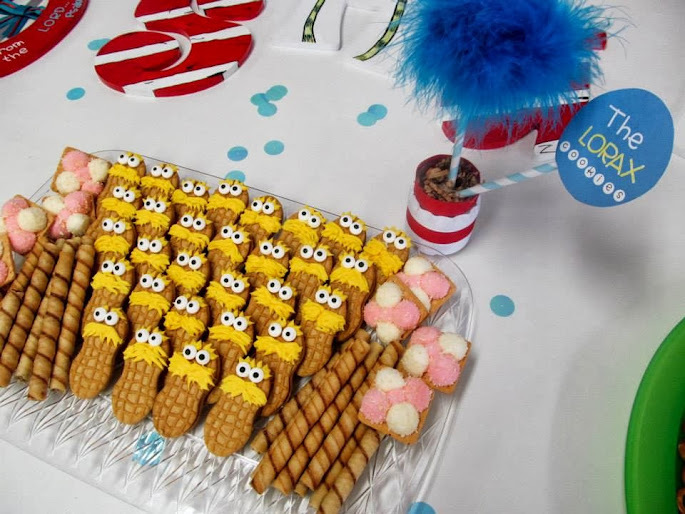 Andrea did these, of course, as well as all the signs and the truffula trees in the jars with the signs, made with fancy spiral straws and pieces of feather boas! I could just die. I can’t get over them. Sorry, moving on beyond these cookies are hard. But I’ll try. 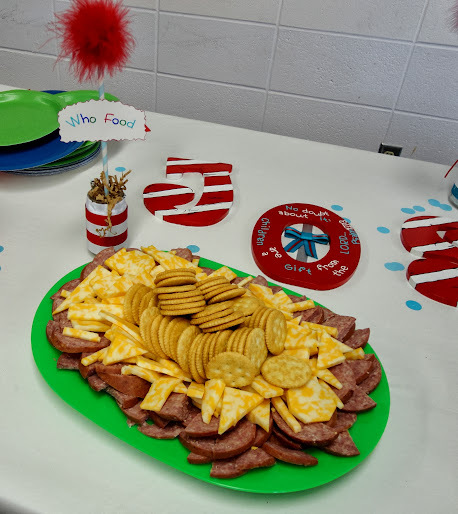 Green Eggs & Ham Pretzels? Seriously? Too much cuteness! 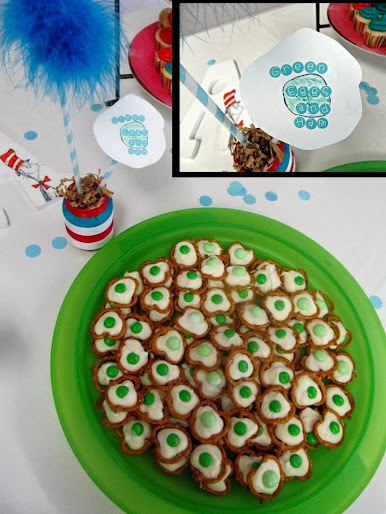 Becky and Katerina made these together – just some white chocolate melted on top of pretzels with a green M&M in the middle. Love. So colorful and cute! They were the perfect size and even had little sprinkles inside. Not to mention delicious! Pink Yink Ink Drink made with diet 7-Up and slices of lemon, lime and orange. 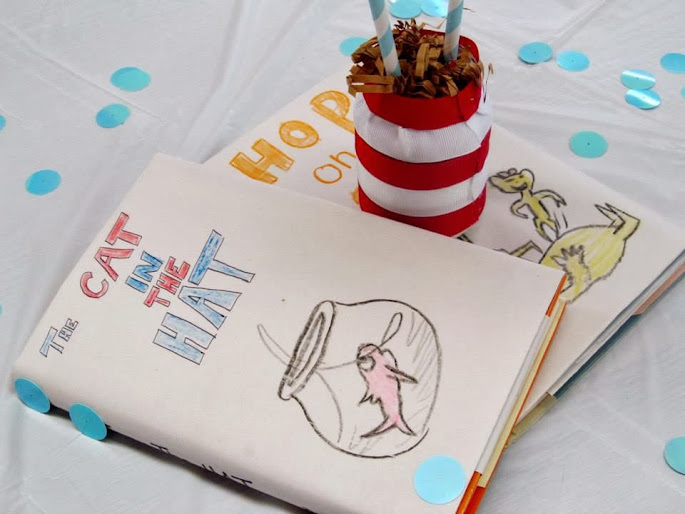 Each table had books with covers made to look like Dr. Seuss books, drawn by Andrea’s daughter, Faith. I guess we know where Faith inherited her talent from! We started with games created by Tessa, who helped from afar while on her mission trip in SE Asia. I thought that was really neat that she could help from so far away so that all the sisters were involved! Dennis stayed for about half the shower, then escaped with his Dad to a gun show (how funny that he did the same thing at my Lil’ Pumpkin shower, leaving with his Dad to go to the shooting range. Men and their guns! ha!). 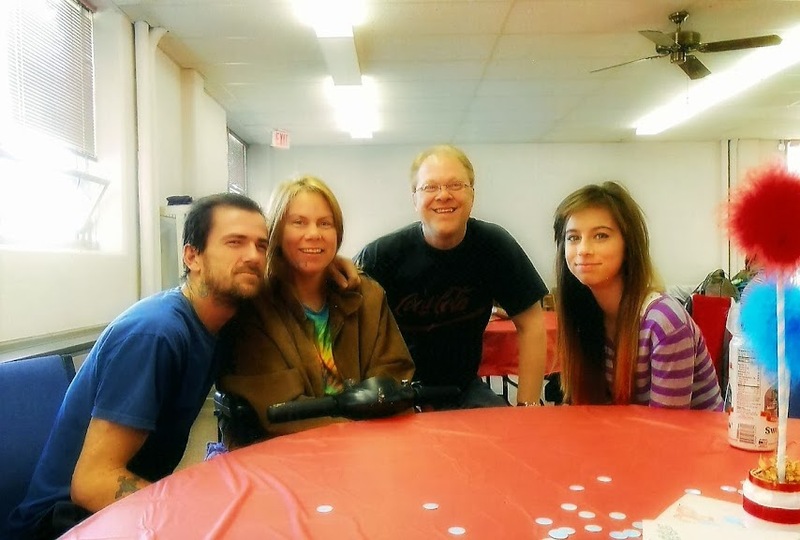 We were blessed that his old friend, Stacia, could make it, and he got to spend some time with her. If it weren’t for Stacia, Dennis and I never would have met. I’m about to go off on a tangent here, and hope you’ll bear with me…or you can just move ahead and skip this paragraph. To make a long story short, she was in a bad car accident (she has been a paraplegic ever since) and was in Wesley hospital at the same time Kirstie Alley’s father was there for an operation. Kirstie connected with Stacia while visiting her father, and then gave her some Dianetics and Scientology books (she’s a Scientologist and started the mission in Wichita, if you didn’t know). Stacia wasn’t interested, but when Dennis came to visit, he took Dianetics, as he loves to learn and read everything. He was intrigued, and one thing led to another, and he ended up on staff at the Church of Scientology in Wichita. Not long after, I filled out a personality test they’d put in the newspaper and ended up taking my first class there, and eventually ended up on staff too. We married two years later! I know that’s a crazy story (and I didn’t even include the part about dating Dennis’ best friend first-lol), but basically we have Stacia to thank for bringing us together! And it was so worth all the grief we went through as Scientologists in our early days. 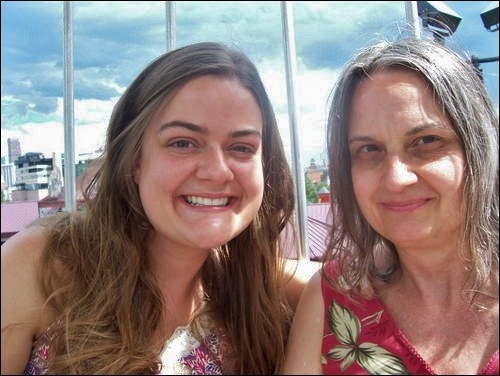 Stacia is one of the most loving, truly sweet people you could ever know. I was so glad she was able to make it, as we hadn’t seen her (or her daughter, behind us in the picture above) for about ten years! 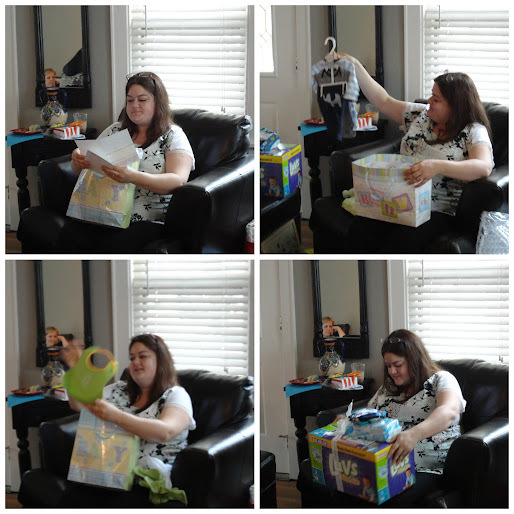 Gift-opening photos bore me, especially when they’re of myself, so I made a couple collages so I wouldn’t bore you too much with them. I started off opening the big gifts (with some help from little Madalee, Den’s third cousin) since they were closest, and just feel so blessed we got the few big things left that we really needed! A gate with a swinging “door” to block the stairs leading to the back door and basement once Joshua begins to crawl. The door you can swing open on it will make letting Jessie through it to go to her doggy door and outside so much easier! A bunch of Den’s family chipped in to purchase it, along with the high chair/booster seat that I wanted instead of a regular high chair. It came highly recommended to me by three Moms because it doesn’t take up extra space (you put it on a regular chair), it’s easy to clean, and you can travel easily with it. So glad to have that! 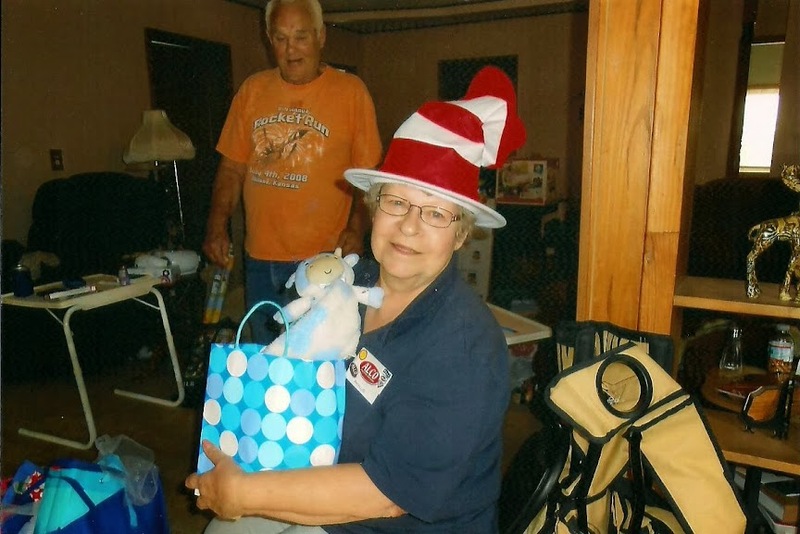 And Phyllis, Den’s Mom, also got us a car seat. We had bought a used one from our neighbor but feel so much better having a new one that we don’t have to worry about being out of date or having any issues, plus it’s padded better for an infant and doesn’t have any sawdust on it (we’re having some sawdust issues right now-lol). Hurray!! 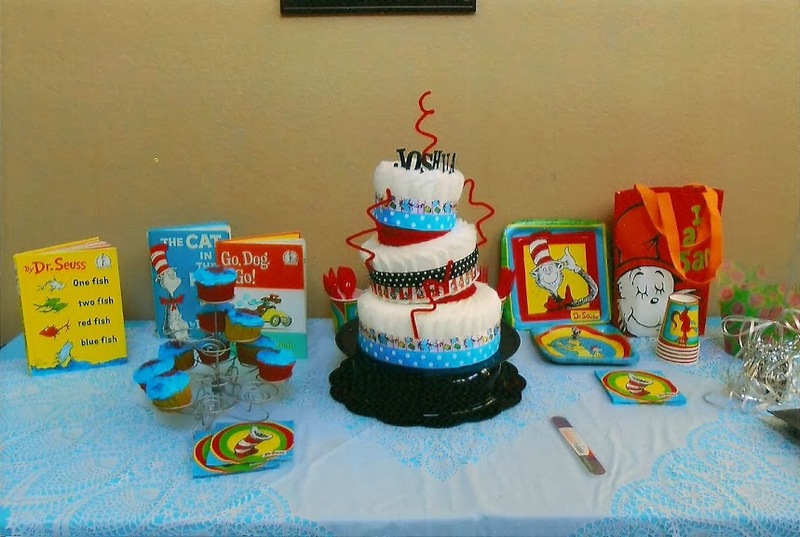 Posted in Pregnancy, Thanksgivings and tagged baby shower, Dr. Seuss, Green Eggs and Ham, Lorax Nutter Butter cookies. Bookmark the permalink. 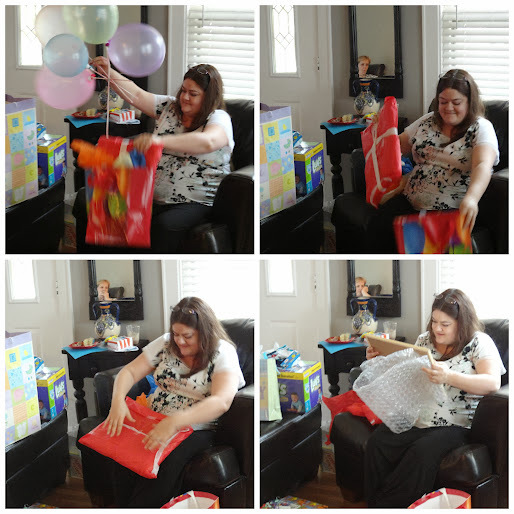 This technically wasn’t a shower for me, but the gifts were for Joshua, so I’m counting it as my first shower. This is something my sister-in-law, Joan’s, wonderful friends came up with. Joan, Joni, Jill, Anne, Linda and Marge (mother of Joni, Jill, and Linda) in the front. 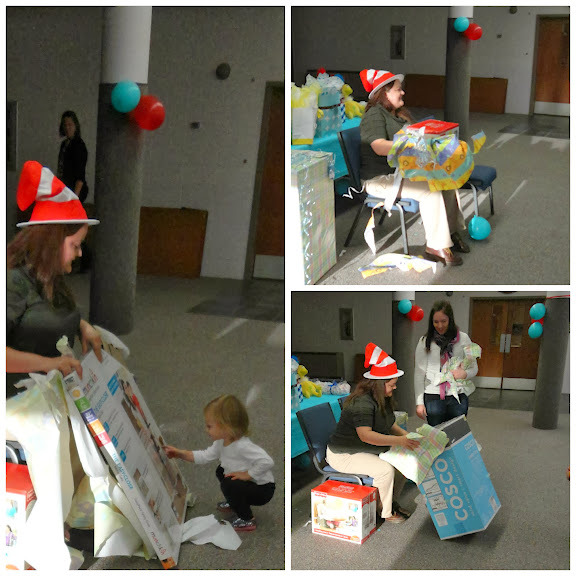 Linda and her daughter, Samantha, were the hostesses. 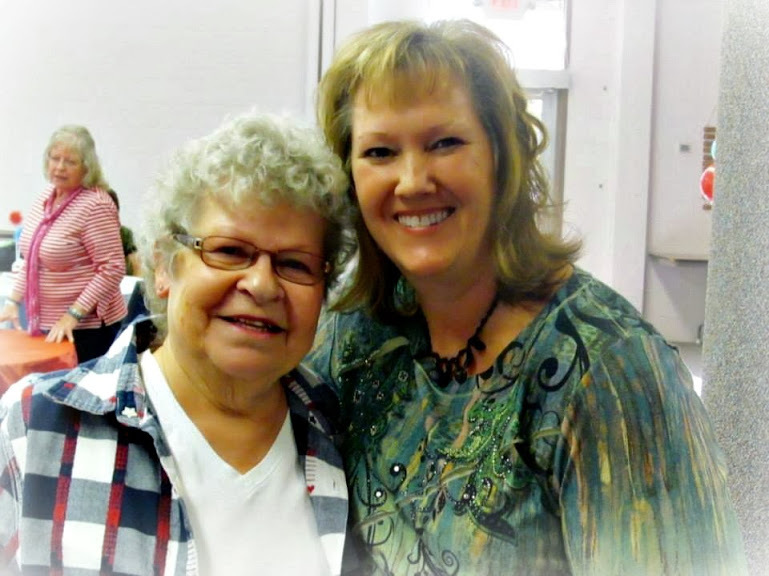 Every year, Joan joins her the girlfriends she’s had since high school, and who are now spread across Kansas, Missouri, and Colorado, for a girls’ retreat. They’ve been doing this for 27 years and never missed a single one. 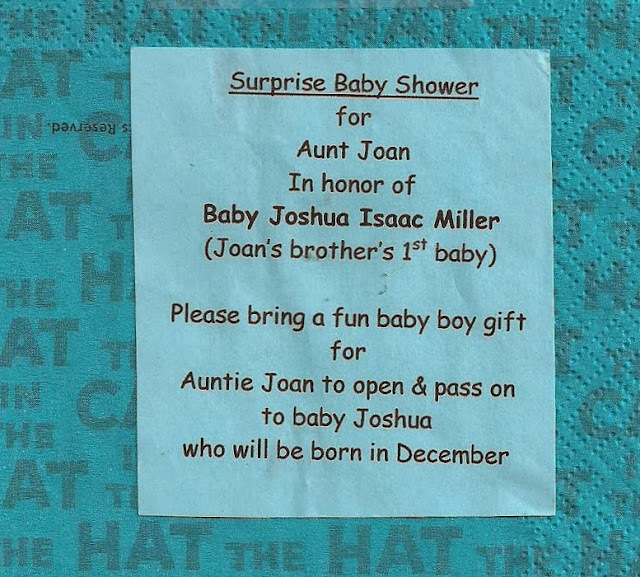 This time it was at Linda’s home in in Colorado, and they really surprised Joan when she arrived, throwing her an Aunt Shower! This was such a neat idea. Knowing how excited Joan is to finally be an Aunt (we weren’t the only ones waiting for Joshua! 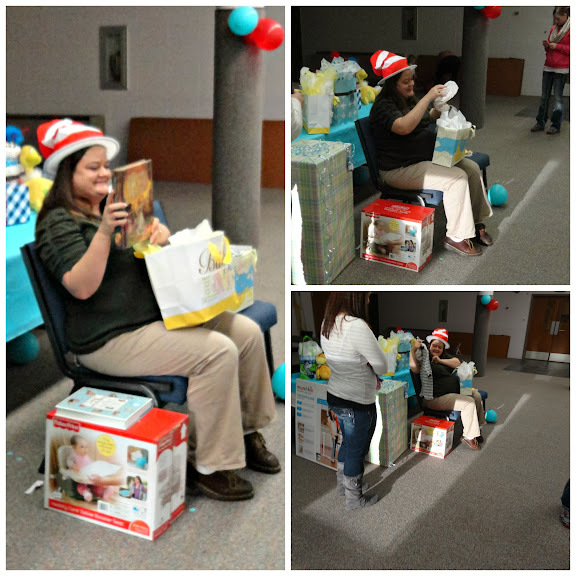 ), her friends all bought gifts for her to open and then pass on to her nephew. 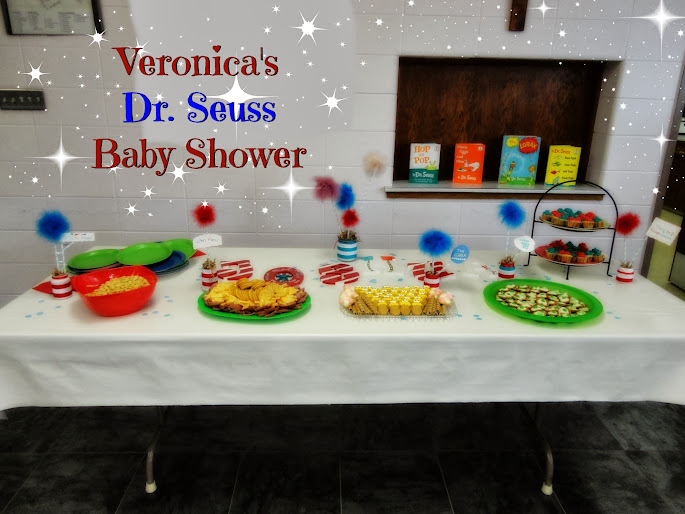 Knowing our nursery theme, they did a Dr. Seuss shower for her. Does she not have the best friends ever? How clever and thoughtful is this?! Joan got some awesome gifts from her friends for us. Isn’t it amazing how someone can be blessed through another? Who would have thought that I’d be getting gifts from friends of friends? So crazy! 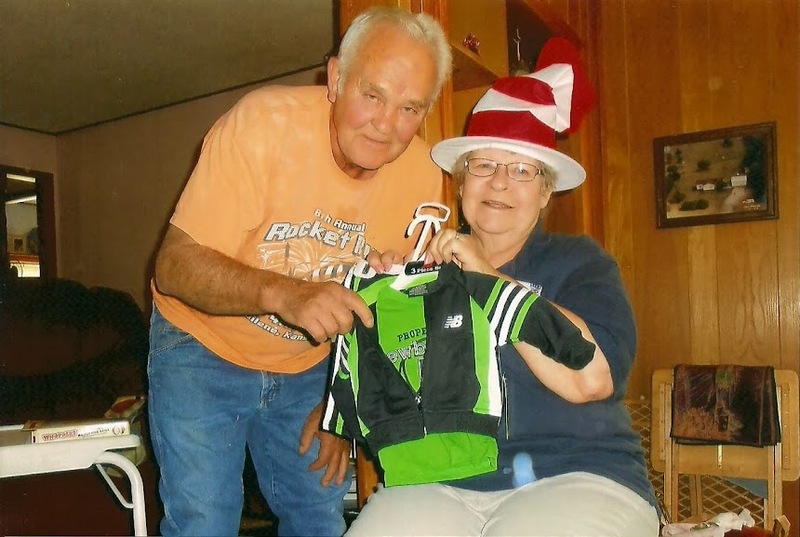 You might have seen that onesie hanging in the closet on my last Thankful Thursday – too cute! We’ve already got these picture frames hung- they look GREAT in the room, but I have to show you another time since the walls are currently a work in progress as we are hanging things. Have you ever seen such a tiny track suit?! It even has matching pants! We came to Abilene the night before my Lil’ Pumpkin Baby Shower to watch our nephew, Carson, play his last home game (he graduates this year – they grow up so fast! Afterward, we stopped at Mom and Dad’s and Joan said “why don’t you sit down for a bit?” and I did, ready to visit a while before we had to head back to Wichita. 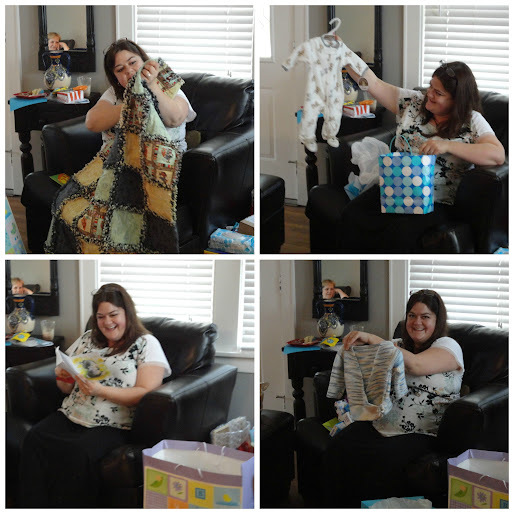 But oh no, instead Joan surprised us with the gifts from her Aunt shower! Unfortunately I don’t have any photos to share of us opening them, but I assure you it was a delight! 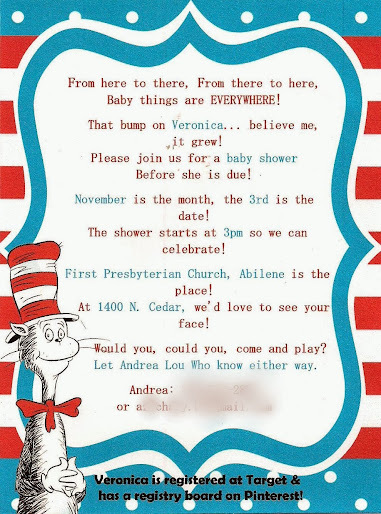 Just to give you an idea, here’s one from my Abilene shower where I had to wear the Dr. Seuss hat. lol! 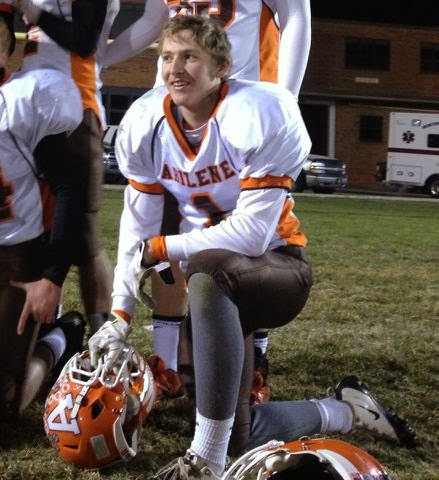 Please come back tomorrow to hear about my wonderful Abilene shower hosted by Den’s family! Can you guess what the theme was?